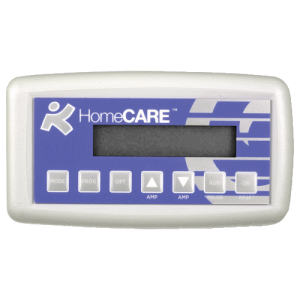 There are advantages to using pulsed EMF (PEMF) in wound care. The magnetic heads don’t require adhesive electrode pads or wet contacts when treating fragile skin around peripheral wounds and therefore reduce the risks associated with those applications. The magnetic heads can be used without removing protective or compressive bandages and allow treatment through both clothing and bandages. During treatment, the magnetic star discs should be placed so that they bracket, or are on either side of, the area being treated so the magnetic field travels through the target tissue. Magnetic fields travel through fabric and do not require water or electrode gel as a conductive medium. The magnetic fields deliver the frequencies we have found to be effective in FSM therapy. *Precision Distributing is currently unable to sell the Magnetic Converter into Canada. The FSM Magnetic Converter was developed by engineers associated with Bart Flick MD at Reset Manufacturing, in Clayton Georgia. Dr. Flick was one of Dr. Becker’s residents and has been studying and using electromagnetic therapies since the 1980’s. Dr. Flick arranged the FSM scar tissue study in burn patients in 2003 and took the FSM Core seminar in 2014. Dr. Flick reported excellent results with pulsed magnetic therapy when it was coupled with use of specific frequencies. His primary use was in wound healing, venous stasis and diabetic ulcers, neurological conditions and trauma. But he also reports good success with pain and various visceral conditions. He is an excellent clinician / scientist and has a record of responsible practice. PDI is providing the FSM magnetic Converter because so many people have expressed an interest in pulsed EMF devices over the last 5 years. The other pulsed EMF devices on the market cannot run programmed specific frequencies. They produce random magnetic pulses or make bizarre claims about being able to “scan for conditions” and then treat them without the practitioner knowing what is being delivered. 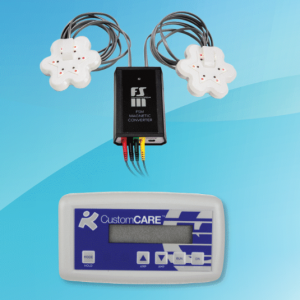 The FSM Magnetic Converter provides frequency specific magnetic field therapy for the practitioner who wants to use magnetic field therapies in their office and be certain of the frequencies used and delivered. 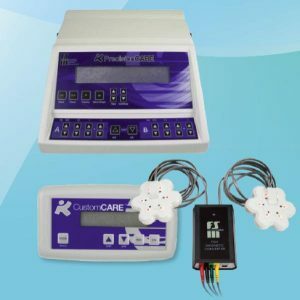 The manufacturer and distributor of this device make no claims about the device being able to diagnose, cure, mitigate, treat or prevent any condition or disease. The use of specific frequencies and frequency specific magnetic therapy has not been evaluated or approved by the FDA. The magnetic converter has no controls and simply converts frequency specific electrical pulses into frequency specific magnetic pulses. Training: The Magnetic converter does not require additional training. It does not have independent controls. The FSM Core and advanced seminars provide adequate training in frequency specific concepts and protocols. The Magnetic Converter use is self- explanatory. 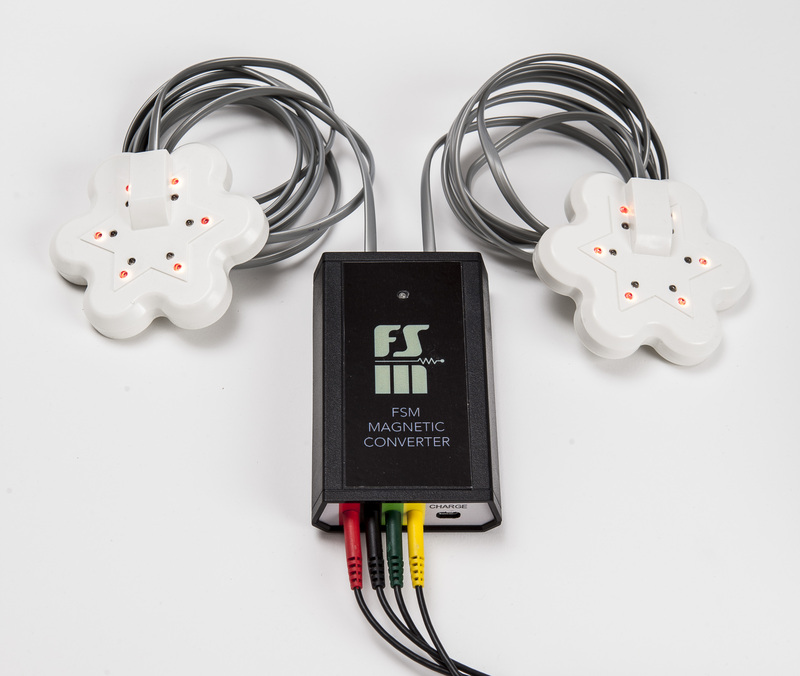 Connect the converter to an FSM device and place the magnets so the field runs through the area to be treated or the area of interest and press the “Run” button on the FSM microcurrent device. The conductivity bars should appear on the FSM device and the red and yellow LED lights should light up on the magnetic star discs. 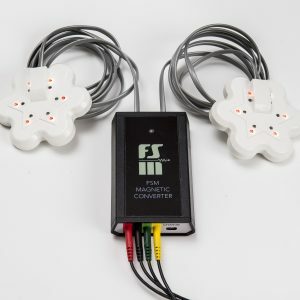 Be the first to review “FSM Magnetic Converter – Pulsed Electromagnetic Field Therapy” Click here to cancel reply.